Anything can go viral online. Be it a well-thought-out campaign or an absolutely random post. But of course, not everything that becomes discussed is good for your brand. Think of H&M’s controversial hoodie ads. Monitoring what people say about your brand in real time helps to tackle these issues even before they start. Google Alerts is a free platform for monitoring the web. But the problem with Google Alerts is that it brings you web mentions only, completely ignoring social media, where most of the buzz happens. Luckily, there are lots of advanced tools that help you not only monitor social media but also spy on your competitors, get influencers and sales prospects. To make your life easier, we’ve tested the best Google Alerts alternatives and have come up with the list of tools to get you started. 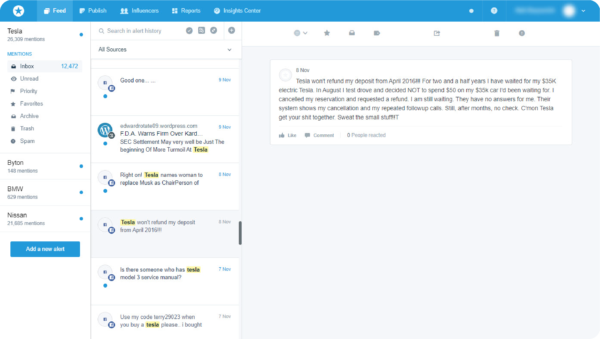 Awario collects mentions of your brand(s), industry, competitors, brings you new influencers and sales prospects. The app is great for online reputation management, as it lets you interact with mentions from different sources without leaving the app. All users can set up a Boolean query, which helps collect more precise results. The reports section provides rich analytics such as top influencers, sentiment analysis, reach, etc. Awario is rather new-to-the-game, but it’s rapidly developing. Most of the Enterprise-level features, such as shareable reports, white labeling, or data export are already implemented into Awario, but the prices are still very affordable. Pricing: Before purchasing, you have 14 days to try the app. The Starter plan is $29, Pro is $89, Enterprise is $299. Purchasing an annual plan will save you 15%. The app is popular among small- to medium-size businesses. Available platforms: Twitter, Facebook, Instagram, Google+, YouTube, Reddit, news/blogs, the web. The main purpose of Sprout Social is to create a unified inbox for a company’s social profiles. The platform offers customizable reports, lets you assign tasks to your team members, and schedule publishing. But what’s interesting for us is its monitoring capabilities. 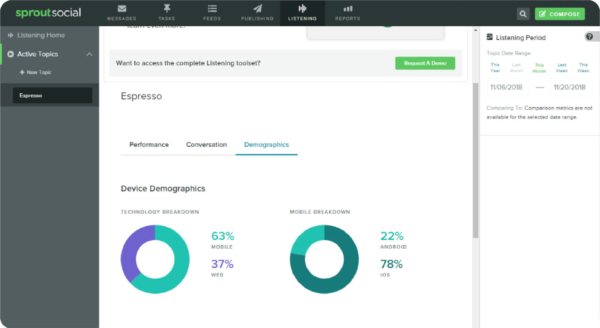 Instead of a traditional mention feed, the app’s listening module displays all data in the form of statistics — you can see the performance of your topic in terms of engagement, impressions, and sentiment and check out the demographics for your keywords. However, Sprout Social doesn’t let you interact with mentions, and users with the basic plan get data from Twitter only. Pricing: There’s a 30-days free trial. The subscription plans start at $99 per user/month. The corporate plan is $149 per user/month, and Enterprise is $249 per user/month. Available platforms: Twitter, Instagram, Reddit, YouTube, Tumblr, the web. 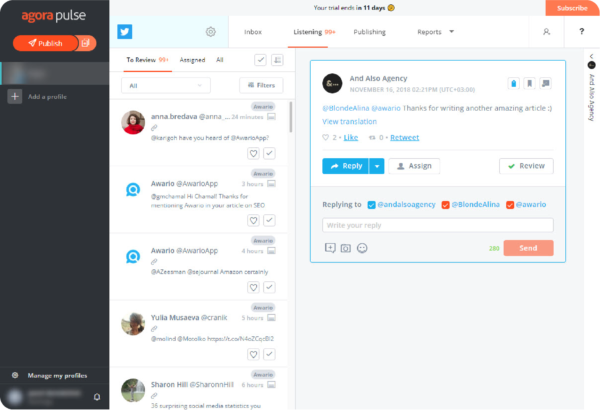 Agorapulse is a combination of two platforms — one for social listening and one for social media scheduling. With Agorapulse you can interact with people mentioning your brand right from the app. The faster you do this, the more satisfied your (potential) clients are. And for that reason, Agorapulse lets you invite team members and assign mentions to them, which is amazing for big projects or large companies. Unfortunately, Agorapulse doesn’t offer web monitoring yet. Pricing: The platform offers 4 plans: Small for $49/month, Medium for $99/month, Large for $199/month, and Enterprise for $299/month. Annual plans will save you up to 35%. Available platforms: Facebook, Twitter, Instagram, and YouTube. 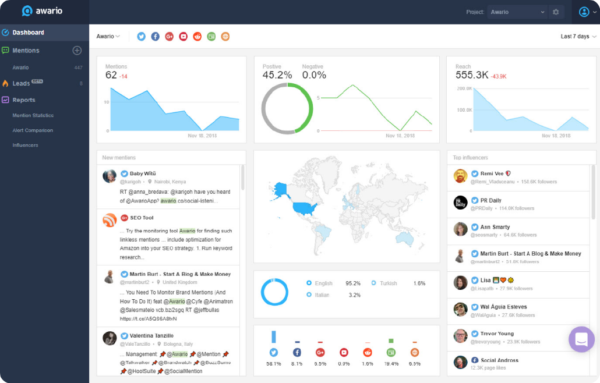 Mention is another social media and web monitoring tool. Mention has a unique set of features, including a handy influencer dashboard and API access. Mention has its own great reports, but with the Insights Center reports become customizable and automatable.